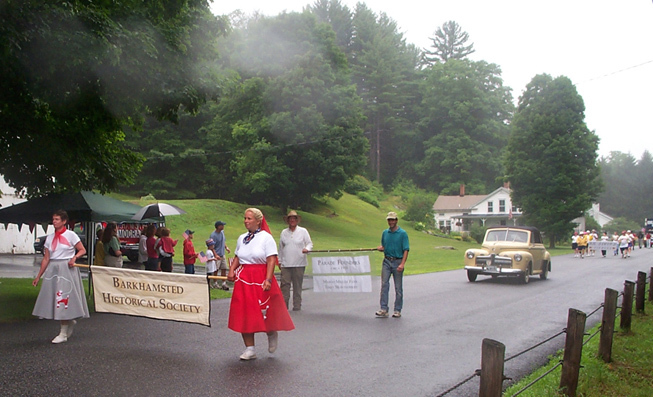 Here in Barkhamsted we love our Independence Day parade, even when it rains. The Historical Society took part in the parade this year (2004) and of course focused on the history of the parade itself. The parade has been held annually since the mid 1950's when the Reverend George Ackerly got things going. Reverend Ackerly had returned from India after many years there as a missionary. Before going to India, he had been the minister at the Pleasant Valley Methodist Church, and remembered that a town parade had been held on the 4th of July. He wanted to revive this tradition, so he grabbed his trombone, and, with a bunch of school kids from the neighborhood, marched through Pleasant Valley. Since then the parade has grown in size. George would be proud. Fifty some years later the Historical Society marches in the parade and recognizes George's revival efforts during the 1950's. Above- the Historical Society contingent in the Independence Day parade at Pleasant Valley. Noreen Watson and Karen Ansaldi carry the banner. They are dressed in 1950's era garb which is when the town's parade was resurrected. Behind them is Historical Society President Walt Landgraf (white shirt) and Erik Landgraf carrying a sign noting the 1950s origin of the parade. In the yellow car ride two parade marchers that participated in the first parades 50 years ago. 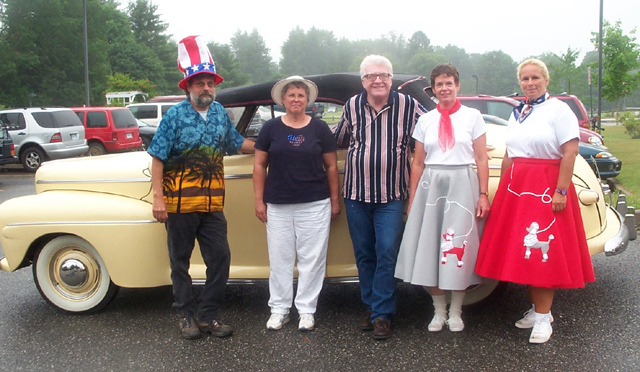 Margo Miller Fenn (second from left) and Terry Montgomery (third from left) were honored for their participation in the first town parades resurrected in the 1950's. At the far left is driver Jim Fenn. To the right of Terry are Historical Society marchers Noreen Watson and Karen Ansaldi in 1950's era dress.